Even before Waleed Zaru officially started working in international development, he was helping build up his country’s private sector—first by managing the rapid growth of a Palestinian home builder and then working with a local nongovernmental organization (NGO) focused on local capacity building and community education programs for generating jobs. 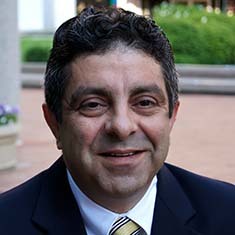 Waleed currently oversees the U.S. Government Operations and Systems Team: a group of worldwide professionals offering a range of expertise and services in environmental compliance, infrastructure, procurement, training and capacity building, project start-up implementation and close-down, and field-based processes and practices, including project finance and accounting. Through these services, Operations and Systems promotes efficient and effective cross-regional operations, timely implementation of projects, elimination of waste, and reduction of costs, all in the most compliant manner possible. Waleed first managed a DAI-led and U.S. Agency for International Development (USAID)-funded program in the West Bank and Gaza providing project financial management oversight in the administration of millions of dollars in grant funds. The program was successfully completed, and provided assistance to 100 companies and generated approximately 700 new employment opportunities in the rehabilitation of the country’s war-torn economy. Prior to joining DAI in 2002, Waleed worked with the Tamer Institute for Community Education where he managed several grant programs including a U.K. Department for International Development (DFID) grant for assisting Middle East/Palestinian publishing houses; and a Swedish International Development Cooperation Agency (SIDA) multimillion-dollar grant to assist 60 West Bank and Gaza libraries in improving their services and the quality of books and periodicals. He has also handled minor grant programs from Oxfam Britain and the French Development Office in Jerusalem. Waleed works closely with DAI senior management and liaises regularly with field Finance Directors and Chiefs of Party to deliver the most efficient and sound financial management.